H2OExcel™ is a proprietary blend of desert plant extracts and high quality humic acid containing biologicals and other all natural non plant derived nutrient enhancers. It is highly efficient and can change the polarity of water and soil, increase biological activity, interact with soil capillarity pressure and defend against dehydration of both the soil and plants by keeping water available deeper in the soil profile. 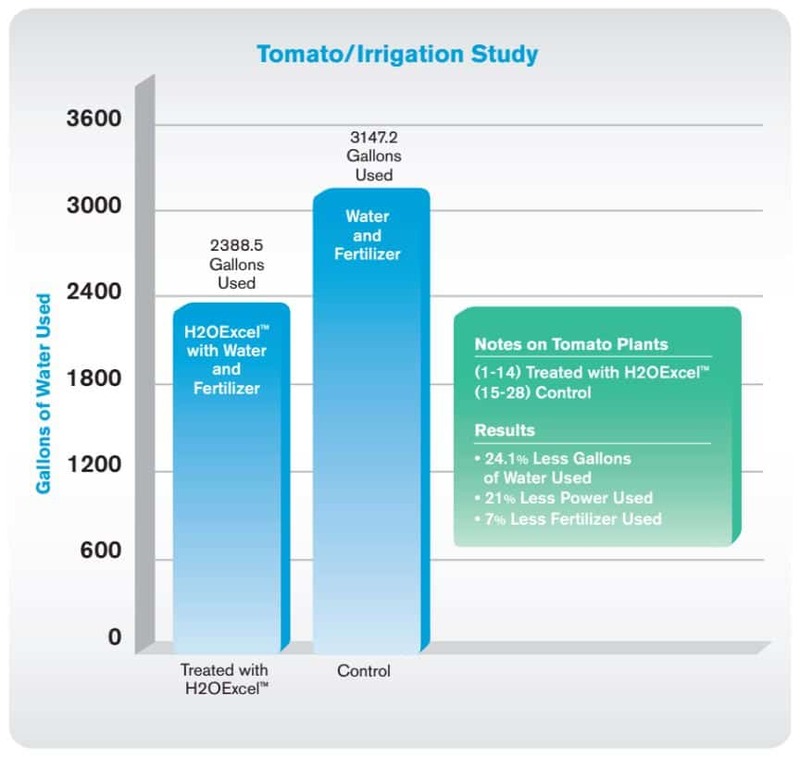 H2OExcel™ provides a unique opportunity to increase available nutrients and balance the amount of water within the root zone of growing plants by supercharging biological activity. H2OExcel™ is a perfect tank mix partner with most pesticides and nutrients. It is highly flexible and can be used in any delivery system available in all types of growing environments. For the majority of land, water will simply take the path of least resistance. It will run off or pool in low-lying areas and evaporate. These conditions commonly lead to overwatering of plants, crops and turf where leaf damage can occur and water does not reach the root system. H2OExcel™ enables soils to absorb water faster and deeper than normal by reducing surface tension of both respectively. This puts water in the root zone where it is more readily absorbed and nutrients are made soluble for increased uptake to the plant. Once H2OExcel™ infiltrates the soil it will not harm any plants and is not toxic to any animal, making it ideal to use anytime and everywhere. H2OExcel™ also serves to increase biological activity around the root zone making more nutrients available. H2OExcel™ promotes water efficiency, in turn making water more available, especially during times of stress. The performance of H2OExcel™ is second to none as it does not have the limitations of the typical polymer and silicone competitors and is not limited by exposure restrictions. H2OExcel™ can lead to water-use reductions of up to 50%, thereby reducing dependence on water and leading to a cost savings for all who take advantage of its unique formula. Mix H2OExcel™ in water and apply as a spray or soil-drench as listed below. Spray mixture or use injection/irrigation system on plants, crops, or turf. Even on dried, caked and hardened soil, water is absorbed quickly without run-off. Repeat application process each time watering is required. Do not use this product in the concentrated form. H2OExcel™ is tank-mix compatible with fertilizers, herbicides, pesticides and mixes easily in cold water and stays in solution. The characteristics of water and the presence of hardened and unreceptive soils can make it difficult for water to reach existing plant life. Applying H2OExcel™ helps soils absorb water more quickly and efficiently.